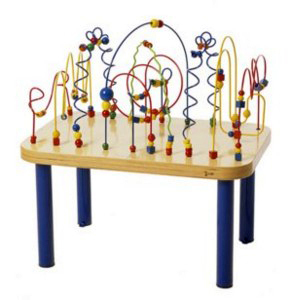 104 wooden beads gliding over 10 play wires that have been secured into a solid Baltic Birch table top which means there are no removable parts. The sculptured wires are locked into place with our stainless steel anchoring system that has been developed to extend the life of this play center in busy settings. For added safety, the steel legs can be bolted to the floor.